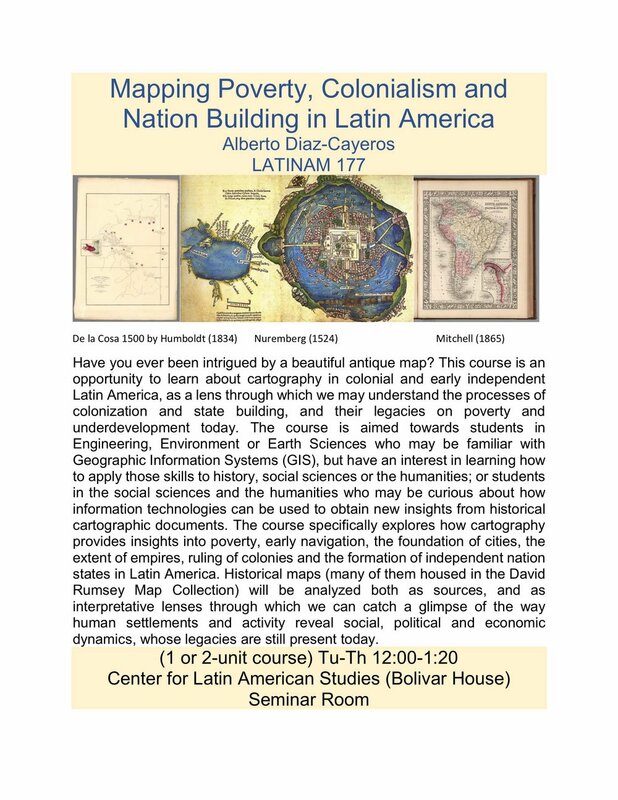 I am teaching a somewhat experimental course on Historical Cartography for the second time this quarter. I am not sure whether the interest is broad enough, or if the experience of watching recorded presentations attractive enough, but I am posting here some of the videos of the lectures as well as the syllabus and the class presentation slides. Also see the presentation by Rodolfo Acuña Soto (UNAM) that Friday at the CLAS seminar: Geomorphology and the occurrence of famines, epidemics and social conflict in Mexico, the last 1000 years, exploring the role of geography, historical epidemics, and rebellion in Mexico. In this session I also covered materials on Ports as nodes of communication with the metropolis and the challenge of broadcasting power to the hinterland. At the core of any discussion of contemporary poverty and exclusion, what is the real impact of the colonial legacy? The construction of those imagined communities and the conundrum on state strength. The course then shifts into a workshop for students to study, visualize and analyze a historical map as an individual project. These are my slides on a checklist of what to look for when analyzing a historical cartographic source. As students learn some GIS tools for their projects, Mapschool is a useful website to get up to speed. También se puede consultar la Introducción a SIG de Mapschool en castellano. In our course we barely touch the surface, with a session Introducing GIS in ArcMap and a second session on georeferrencing.